In this fruit tips section, you will find tips about buying fruits, eating fruits, storing fruits till you are ready to use them, using the fruits in cooking etc. Include fruit in every meal or snack. When you can not get fresh fruit, eat dry fruits if possible. Why should we consume more fruits? Making fruits a part of your daily diet can improve general health, give more energy. Fruits can reduce the risk of chronic diseases. Most fruits are low in calories, fat and sodium. Fruits do not contain cholesterol. Everyone, whatever age, can benefit with the increased consumption of fruit. 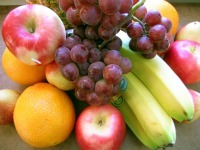 Fruits provide us natural sugars and nutrition. Many fruits provide vitamin C. It helps to improve immunity, help growth, helps healing wounds and the health of your teeth and gums. Consuming fruits adds to the natural dietary fiber consumption which improves digestion and elimination process. Eating fiber rich fruits can reduce the possibility of many health problems such as heart disease, stroke, type 2 diabetes. Eating fruits high in potassium may lower blood pressure, and may also reduce the risk of developing kidney stones and help to fight bone loss. Fruits are generally low calorie compared to many snack items. This can help in weight loss. It is always better to buy and consume seasonal fruits. Not only they are cheaper, nature intended you to use them in that season because they provide the specific nutrients needed for that season. These fruits are beneficial to your health. There are some fruits available the year round and these can be consumed at all the times. Though many fruits are available in frozen - preserved - canned - tinned forms, it is always better to buy and use the fresh fruits. They benefit you more and they taste better too. The preserved/canned/tinned fruits may contain extra sugar, salt or chemicals added for preservation. Your body does not need these added substances, in fact, some of them may be harmful to your health. Therefore you can avoid them by consuming fresh fruits. If you buy pre-cut packaged fruits, choose fruits that do not contain additional sugar. It is always better to consume fruits than the fruit juice as fruits provide you with more natural dietary fiber. Fruits should be a part of every meal if possible. That is fresh fruits, canned fruits(without added sugar), dried fruits. Adults are supposed to eat at least 5 serving per day. Eat a variety of fruits. Each type of fruit contains different nutrition needed for the healthy body. Fruits like apples, bananas are available the whole year. Look for bright colored and tight fruit. Do not buy if the fruit is soft, wrinkled or has dark spots or looks damaged. A variety of apples are available. 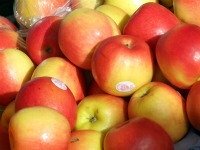 Such as granny smith apple, Fuji apple, Simla apples, golden apple etc. Choose according to how you want to use it. Store apples in the refrigerator in plastic bags with holes. Read more Banana tips - buying, storing, ripening and using bananas. Come back to read more as we will be adding info about other fruits.